Hair transplant is a procedure used to treat areas of hair loss by transplanting hair from one site of the body to another. It is primarily used in male pattern baldness, but is also used in female pattern baldness, loss of hair due to trauma, burns, surgical incisions, etc. Male pattern baldness forms the bulk of the cases, upto 95%. Balding persons of all ages can get hair transplant done. 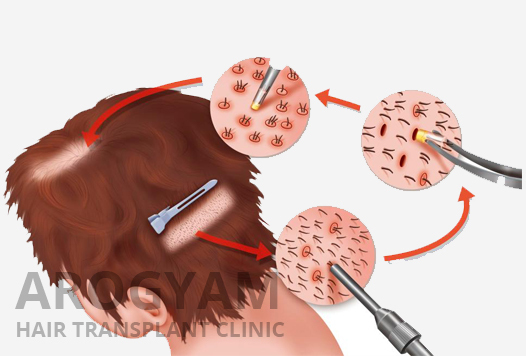 Age range of hair transplant done in Arogyam Hair Transplant clinic ranges from 14 years (a young girl with burn injury of the scalp) to a 72 year old male. Hair transplant is a cosmetic procedure. It is a purely elective procedure and personal aspirations of the patient are the main driving force for having this operation. Benefits from this procedure can be immense. Baldness can affect both social and professional life of the people who suffer from it, and people who are sensitive to it can become very self conscious about this and are unable to interact confidently with other persons. A hair transplant can be life changing in these situations. Male pattern baldness or Androgenetic alopecia is controlled genetically. The hair follicles are genetically programmed to stop producing hair at a certain age which is determined by hereditary factors. These genes are activated by the effect of testosterone. Hair loss is graded according to the Norwood scale and graded from 1 to 7.During the balding process, the hair does not fall off directly, instead the hairs start getting thinner and shorter and do not reach their full length. In this way the density of hair covering the scalp is decreased. Hairs which fall off and are seen on the pillow and during showers are not due to balding. The first recorded cases of hair transplant began in the early nineteenth century when some surgeons transplanted scalp flaps and free grafts to bald areas. Hair transplant was also done in Japan around 1930 when hair was transplanted to replace damaged eyebrows. Modern era of hair transplant began in late 1950’s when Dr. N. Orentreich transplanted free donor grafts to bald areas. He demonstrated that hair longevity was ‘donor dominant’, that is, the lifetime of a hair was determined by the site in which it grew originally and not the site to which it was transplanted. Dr. P. Walter defined the ‘Safe Donor Zone’ which contained hair with the maximum lifetime longevity. Surgeons continued to develop techniques to transplant smaller and smaller grafts. Initially punch grafts were taken, but this gave an unnatural appearance to the new hair. In 1990, Limmer developed the technique of using microscopes to dissect follicular hair units from strips. Since then, the follicular unit has become the gold standard for transplantation. 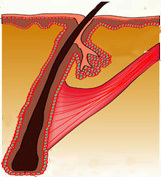 In 2002, FUE with extraction of single follicular units was developed. Initially manual punches were used but since 2004, motorized drills have come to be used in FUE and this is the most advanced technique at present. The concept of ‘Safe Donor Zone’ is the basis of hair transplant. It will be noticed that even in the most bald and elderly person, hair is still retained in the sides and back of the head. These are the areas in which hair is genetically programmed to last throughout life. This forms the catchment area for hair transplant. Hair is taken from this area and then transplanted to the bald areas. Hair is basically like a plant and the skin is like the soil. When a hair is taken out with its root from any area of the body and planted in the skin in a different part of the body, the hair will continue to grow in that area just like a plant which is removed from one field and planted in another.The transplanted hair lasts lifelong and this is what makes hair transplant so valuable. Hair transplant is done by two main methods, FUT and FUE. They differ only in the way hair is extracted, the plantation is done in the same way. In FUT or Follicular Unit Transplantation or Strip Method, a strip of skin 1 cm wide is cut out from the occipital and temporal regions. Technicians then splice this strip into individual hair follicles. These follicles are then transplanted into the bald areas in the second stage. In FUE, in the modern method, a drill of 1 mm size or smaller is used to carefully remove each individual hair follicle containing 1 to 4 hairs. Small round holes are left behind which do not leave any visible scar. 1 out of 4 hair follicles are drilled out and the resulting slightly lower hair density is not noticeable at the donor site. The plantation method is the same. The basic method of plantation is to create a small incision and then insert the hair follicle into it. The incision can be made with a small scalpel or a needle. Recently, customized transplanters like Choi implanters have been developed which makes the procedure faster and easier. Plantation is usually done by assistants. Both the methods are done under Local Anesthesia. The patient remains fully conscious and injections are given in the skin to make the skin numb so that there is no pain during the procedure. FUE has the big advantage that it is much less painful postoperatively and it does not leave behind a scar.In FUT, the patient has a stitch at the back of the head which can cause discomfort for months even after the incision is healed, besides the scar. Maximum of 2000 grafts are done in a day. Usually a session on a single day will last about 6 hours but large sessions will last 8-9 hours. Breaks for lunch, toilet breaks, etc can be taken at any time without any problems. The patient can go home after the session and come again next day for the second session if needed. Typically FUE is more expensive than FUT because the surgeon has to spend more time. Before the procedure, the patient has to be assessed psychologically. His needs are to be understood and the possibilities and limitations of the procedure explained. The patient needs to be explained that he should not expect a miracle like a complete return to his original hair pattern but only camouflaging by obtaining a natural hair line and increased hair density is to be expected. The amount of hair to be transplanted is decided based on factors like the amount of hair loss, costs, the expectations of the patient etc. Patients can go for a small transplant initially and then come back for further implants after 3 years or so as more of the original hair is lost. For plantation, the surgeon has to decide the look of the hairline and then draw it out. The amount of hair planned to be transplanted, the age of the patient, the possibility of further loss of original hair, natural look, the density of hair planned, etc are all factors which need to be considered. Drawing of the hairline is more an art than science. After the procedure is completed, the patient has a bandage at the back of the head but the transplanted area is kept free. Minimal precautions like avoiding rubbing the transplanted hair, etc are advised. Patient can wear a cap to cover the transplanted area from the next day. Shampooing of hair is advised after 4-7 days or earlier to wash out scabs. Final results in hair transplant will take 6 to 9 months to show. After the transplant the hair will initially appear to be growing very nicely after 10 to 20 days. After that about half the hairs will fall. Only the outer portion of the hairs fall and the roots remain inside. This occurs because some of the hairs go into the telogen phase. At the end of one month about half the hairs will be growing and so only half the desired density will be visible. There will be no change for the next three months and it is common for patients to become anxious or depressed in this period. The roots of the hairs which have fallen off will start growing hairs again by the fourth month and the new hairs will start appearing. Almost all the fallen hairs will have appeared by 6 to 9 months and that is why full results should be expected only by 9 months. However, even after 9 months, for upto 1 and a half year, a few hairs will continue appearing and the existing hairs will also grow thicker and darker, and hence results will continue to improve till 1 and a half year. Using FUE, surgeons are now able to use body hair also from the chest, back, arms and legs. Body hair is permanent but remains shorter in length. Using such hair, transplants upto 10,000 hairs have been done. But this is only for the very concerned patient who wants high density; for the average patient transplants of 1000 to 2000 hairs are usually satisfactory. This can be done in multiple sessions also over the years. Hair transplant along with all other cosmetic procedures is growing in popularity in the present times. As people have more luxury and time to spare, no one wants to be left behind in the race for success and happiness. About 100,000 hair transplants were done in the US and about 280,000 worldwide in 2010. It is growing very fast in Asia since the last three years, and India also is showing a rapid growth. Not just male baldness but female hair loss and procedures for eyebrow and eyelash transplantation are also becoming increasingly popular. As with all cosmetic procedures it is a personal choice. For those who feel their baldness is a limitation, hair transplant has emerged as a safe and effective procedure with minimal side effects or drawbacks. Arogyam Hair Transplant clinic has now been started in Downtown hospital to bring the advantages of this procedure to the people of the North-East. The latest FUE technique by motorized drill is used in the center. The aim is to provide the latest technology at an affordable cost and thereby benefit the people of this region. More than 500 patients have been operated till 2017 and many thousands more have been treated medically. The latest techniques and fully surgical safety is ensured to provide the best and safest results to the patient at a standardized cost.